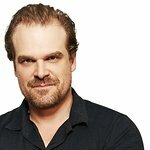 ‘Stranger Things’ star David Harbour and ‘Fantastic Beasts’ star Alison Sudol are on board a Greenpeace ship heading for Antarctic waters. They will help make the case for an Antarctic Ocean Sanctuary backed by campaigners, scientists, over 40 international celebrities and 800,000 people around the world. Following a Twitter challenge, resulting in more than 200,000 retweets in five hours, David Harbour secured a place on the Greenpeace ship alongside singer-songwriter and actress Alison Sudol. They have joined an expedition to gather scientific evidence of the need for an Antarctic Ocean Sanctuary to safeguard species like whales and penguins. Gillian Anderson, Carlos Bardem, Javier Bardem, Sir Quentin Blake, Tanya Burr, Jim Chapman, Gwendoline Christie, Lily Cole, Fearne Cotton, Dame Judi Dench, Tracey Emin, Lena Endre, Hugh Fearnley-Whittingstall, Ralph Fiennes, Sir Ranulph Fiennes, Ben Fogle, Stephen Fry, Roie Galitz, David Gandy, Terry Gilliam, Philip Hoare, Vanessa Kirby, Annie Lennox, Alvaro Longoria, Joanna Lumley, Les Luthiers, Dame Helen Mirren, Thandie Newton, Simon O’Brien, Chris Packham, Simon Pegg, Vanessa Redgrave, David de Rothschild, Jack Rowan, Sir Mark Rylance, Alexander Skarsgård, Alison Steadman, Michaela Strachan, Laura Wells, Vivienne Westwood, and Wang Yuheng. “Well, Greenpeace says the Weddell Sea and its surroundings are home to a precious ecosystem, vital to sustaining our future. And that there’s penguins there. And that I’ll get to waddle around with them, discuss their parenting techniques with them and yes, yes, dance with them. And that they’ll film it. And that if maybe I get enough support from everybody, they’ll gimme that video, so I can rent it out to you (be kind, rewind please).